– Is This Why Everybody’s Now Warning ‘The Big One’ Is Coming? And Do The Animals Know? According to this May 12, 2017 press release from the International Earthquake and Volcano Prediction Center, President Donald Trump’s Secretary of Energy Rick Perry has been notified of an imminent threat to US nuclear facilities from a wave of catastrophic earthquakes that is about to start. 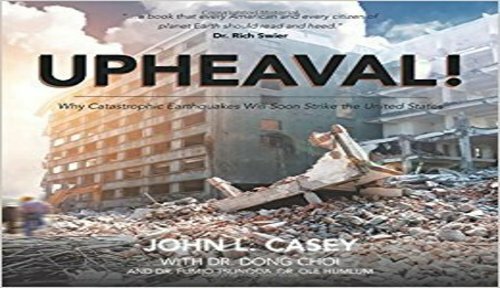 Reporting within their press release that the determination of the scope and scale of this threat is based on years of seismic and climate research by IEVPC scientists that has culminated in the recent publication of the book titled “Upheaval! 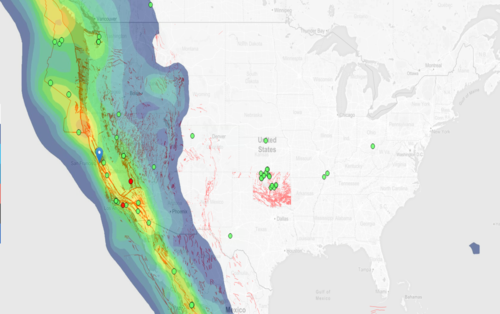 Why Catastrophic Earthquakes Will Soon Strike the United States”, we see the IEVPC’s warnings being echoed now in stories from around the internet and the world that ‘the big one’ is near and there is nothing that can be done to stop it. According to the LA Times story the Drudge Report linked to on Wednesday, fear of earthquakes is a normal part of life in California so people deal with it in different ways – some prepare by retrofitting homes and apartments while for others, that fear prompts denial and a willful ignorance of the dangers which they face the Times reports. Despite the denial, the dangers people face are very real and the LA Times story is a perfect example of stressing the need for preparation for an event which we pray never comes yet, as scientists and experts warn in this particular case, WILL come one day no matter how much people want to deny it. And as we detail below, there are several very good reasons why scientists believe ‘the big one’ is a matter of ‘when’, not ‘if’, as more and more evidence indicates an ‘upheaval’ in the future. Now she is making a dramatically different point. She said that in a keynote speech to international scientists in Japan on May 21, she emphasized that a devastating earthquake will definitely happen, and that there is much the public can do to protect themselves. Denial may getting a bit harder these days. Over the last several years, a few California cities have taken dramatic steps to require retrofits of thousands of vulnerable buildings. And next year, scientists and the U.S. Geological Survey are expected to unveil the first limited public phase of an earthquake early-warning system that would eventually offer seconds and perhaps more than a minute of warning through smartphones and computers. In this new story from the Daily Mail they report that according to a new scientific research study, global exposure to natural disasters has doubled since 1975 with 1 out of every 3 of us now at risk of earthquakes, the largest ‘natural disaster hazard’ that people now face. With a massive landslide recently wiping out a large part of the Pacific Coast Highway being the latest ‘Earth changes’ to remind California they’re quite literally sitting ducks, we see much of the state in the ‘highest hazard’ zone as seen in the map above and at this Earthquake hazard ranking website called Temblor. While California and the San Andreas fault understandably grab much of the attention that’s given to possible devastating earthquakes in the future along the west coast, as we’ve previously reported on ANP, what could be a much more dangerous geophysical hazard to the US lies further north and several hundred miles off of the coast in what is known as the Juan de Fuca Plate. As we read in this story and hear in the 2nd video below, scientists are interested in Juan de Fuca because the miniature plate is the single greatest geophysical threat to the United States. Researchers believe Juan de Fuca’s subduction beneath North America’s continental plate could yield megaquakes several orders of magnitude more powerful than the San Andreas Fault’s largest tremors. With the Juan de Fuca Plate helping to create the ‘Cascadia Subduction Zone’, we remind you of the 2016 Cascadia Rising earthquake and tsunami drills that simulated a 9.0 magnitude quake pummeling the region and the resultant tsunami leaving devastation in its path that could be felt all the way to the East coast with possible cascading utility outages while leaving up to or more than 10,000 dead and possibly millions more displaced. As we also read from Temblor and see in their ‘hazard map’ below, there are numerous faults along the West coast just ready to pop, making the entire West coast region the most hazardous for earthquakes in America by far. As this May 19th story from Temblor reported, the Gulf of California had recently been the home to a series of ‘rapid rupture’ quakes that portend more danger ahead. 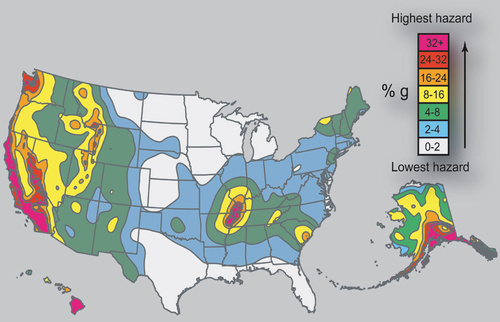 Any examination of possibly catastrophic earthquakes in America cannot be complete without looking at the New Madrid fault zone, a region which has been home to some of the most devastating quakes ever recorded in US history and while the 1811 and 1812 quakes covered over a million square miles and were felt as far away as the East coast, the population in that region then was nothing compared to what it is now. As experts have warned, a New Madrid quake in 2017 could be responsible for ‘black sky days’ all across America with cascading power outages caused by a large quake there, and if history is a guide, it could get much worse. It has not seen significant earthquakes for more than 200 years. In the winter of 1811 and 1812 there were three earthquakes of magnitude 7 – as high as 7.7 – and a series of aftershocks across the American Midwest. The results were catastrophic, with the course of the Mississippi being diverted, chasms ripping open, and volcanoes of sand and water bursting through the ground. The predicted scenario saw close to 715,000 buildings, including 130 hospitals, and 3,500 bridges damaged. Deaths and injuries were estimated at 86,000 with a combined loss of $300billion. The Central US Earthquake Consortium (CUSEC) is based next to Memphis Airport. James Wilkinson, its director, fears the Mississippi would be released from an engineered prison of levees, causing maximum damage. He told The Atlantic: “The thing that, to me, makes the river scary is how much industry we have along it: there’s power plants, there’s chemical plants, there’s ports. In the 1st video below, Joe from the Daily Sheeple breaks down the recent viral LA Times story for us and shares some practically prepping tips and knowledge that anybody living in an earthquake-prone zone should know. Of course, many aspects of ‘earthquake prepping’ can be used in prepping for other emergencies and disasters as well. And while we’re not into the ‘earthquake prediction business’, studies have shown time and again that creatures in the ocean and animals living upon the planet can tell in advance such devastation is coming being much more in touch with the ‘cycle’s of nature’ than most people living in ‘concrete and steel’ jungles across America, many with their heads permanently attached to their cell phones. As the National Geographic has reported, the belief that animals can predict earthquakes has been around for centuries. In 373 B.C., historians recorded that animals, including rats, snakes and weasels, deserted the Greek city of Helice in droves just days before a quake devastated the place. As we reported on ANP back on May 9th, it’s been shown time and again, deep sea creatures often ‘sense’ way ahead of an earthquake that something is about to happen and research has shown that some will often come to the surface before one. As this Wikipedia entry on ‘electroperception’ reports, electroreception is the biological ability to perceive natural electrical stimuli and it has been proposed that sharks can use their acute electric sense to detect the earth’s magnetic field by detecting the weak electric currents induced by their swimming or by the flow of ocean currents. How many other animals have such abilities? It’s also been reported that dogs can sense earthquakes ahead of time and it’s well known in the medical field, some dogs can sense a seizure in a person before one begins. So up for discussion, since we’re also officially ‘mammals’, shouldn’t we have such ‘abilities’ as well?